Breakout® If you want different the colors pop out on this bike. 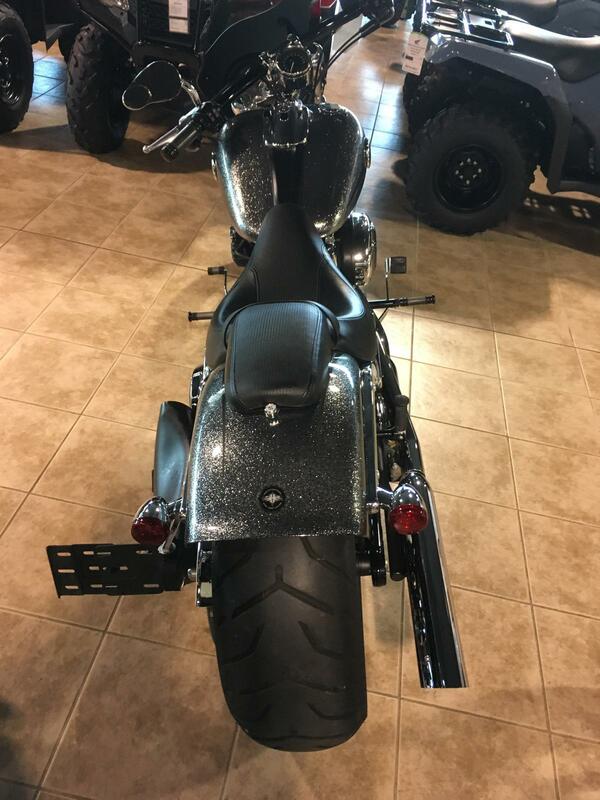 Side-mounted License Plate: We keep the look of the Breakout® model's signature rear clean and minimal with this side-mounted bracket, so nothing gets in the way of the showing off that big rear tire and tight fender. Breakout to the New: Don't just break the mold—forge your own with the latest chapter in Harley-Davidson's legacy of freedom. A premium custom cruiser inspired by the classic Gasser drag bikes of the '50s and '60s, the Softail® Breakout® model rolls with modern power, top-of-the-line treatments and lots of low-down menace. 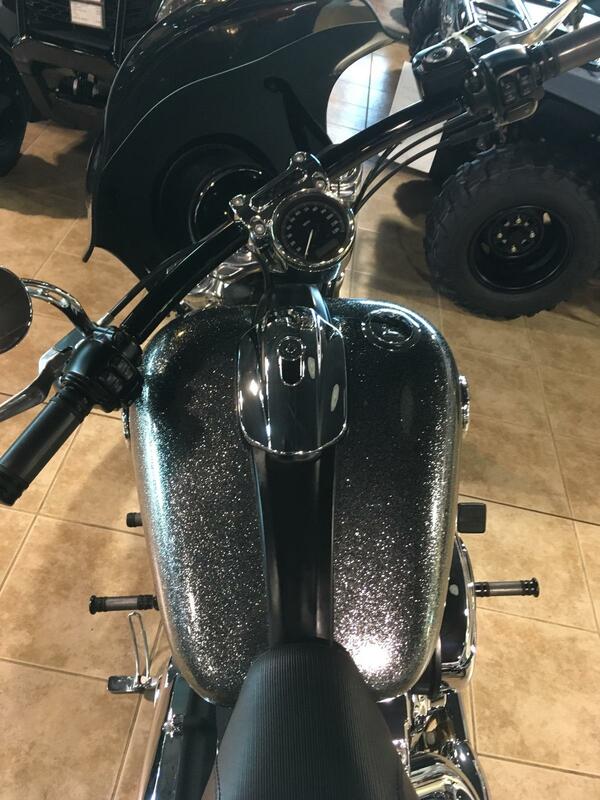 Big wheels, big paint, big chrome, all wrapped in a refined style—the Breakout® model is a true attention-grabber with a ride that's been painstakingly engineered for fun whether you're winding mountain roads or cruising the strip. It may be low-profile, but the Breakout® motorcycle always makes a big, bold statement. Low Muscular Profile: With its big, bold stance, the Breakout® motorcycle makes a powerful impact even standing still. Its pure, clean lines, low-slung profile, stretched stance, big wheels and chopped fenders all shout premium custom, solid power and "look at me" attitude, even as its performance makes it your choice who gets to stare and for how long before you disappear. Premium Craftsmanship: From wheel to wheel, we designed the Breakout® model with a hard eye for excellence: we forged it from top quality materials and crafted it with a dedication to perfection—from paint scheme and chromed-out styling to its slammed design, balanced ride and engine performance, we sweated every single fit, finish and tolerance of this perfect beast, because when you rule the road, there's no place for second best. Premium Finish and 3-D Tank Medallion: The Breakout® model's power definitely includes its visual impact. That bold Ruby Red Sunglow and Vivid Black treatment is an aggressive mix of gleam and darkness, while that exclusive gear-shaped glass-inlaid, cloisonné-and-chrome style tank medallion has a molten, liquid look that catches eyes and declares your ride as the next chapter in the Softail® family heritage. 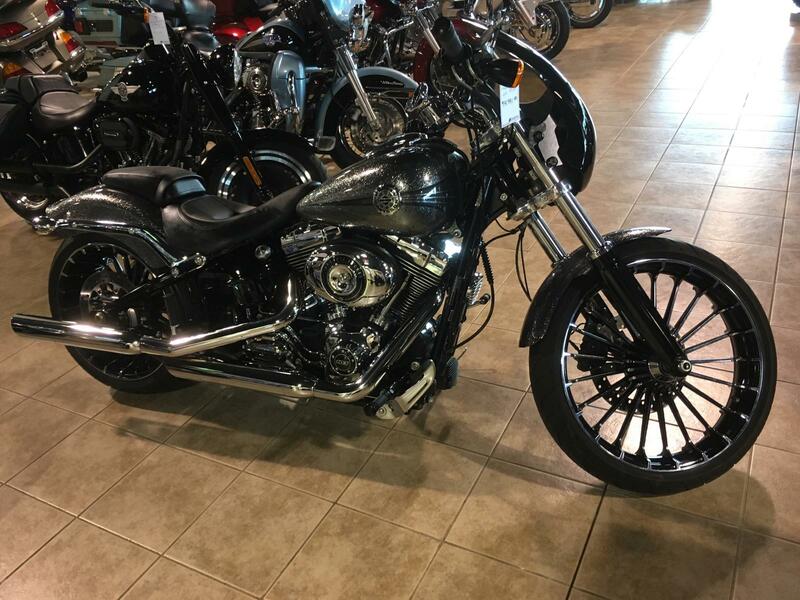 Powerful Front End: The Breakout® model comes on strong with thick, wide forks, chopped fender and that wide-standing big 21-inch, 3 1/2-in wide Gasser wheel raked out there, classic dragster-style. This solid, muscular road stance is matched by neutral and balanced handling, so your ride is as smooth and clean as your looks are mean. Fat Rear Tire profile: Big is the name of the game for the new Breakout® model, and they don't come bigger than this massive 18-inch, 240mm rear tire. It's the widest tire we've ever put on a product motorcycle and, wrapped around that Gasser rim, it’s the perfect embodiment of the classic drag-bike heritage pumping through this ride. Gasser wheels: Exclusively designed for the Breakout® motorcycle, these rims call back to the Gasser dragsters of the '50s and '60s while defining the next generation of custom style. Big and bold with their alternating spokes, these wheels shout strength and durability, while their alternating glossy Vivid Black and machined finishes on every other spoke deliver eye-catching visual impact. Chopped Fenders: Low, tight and cut down to the legal limit, the Breakout® model's fenders add to its stretched and slammed custom style. We chopped them to the legal limit to show off those huge muscular tires and Gasser rims. Plus, the fender supports are one-piece forged aluminum, polished and chromed for the ultimate in strength, weight-reduction and looks. Slammed Console: It's not just slammed, it's the tightest console we've ever smacked onto a tank. And with its integrated decorative vent and electrical lines, its sleek profile adds a distinctive touch of ultra clean custom style to the Breakout® motorcycle’s aggressive stance. Riser-mounted Speedo: All this power and style doesn't come at the expense of comfort and convenience. Feast your eyes on this 4-inch digital speedometer, mounted on risers to be close to your field of vision. It offers speed readout, an analog tachometer on top, along with fuel gauge and gear-shift indicator. Plus, with its adjustable-color backlight, LED and needle, you can configure it to any color combo you want. Six-Speed Cruise Drive® Transmission: You want a ride that rumbles—not begs for mercy—when you lean on it a little. The Six-Speed Cruise Drive® transmission provides smooth, quiet shifting and reduces engine speed on the highway, so you get a better match between engine turnover and road speed. It's a rare ride when a bike responds like this, and a low growl goes a long way when you're opening up the road ahead. Twin Cam 103™ Engine Power: Live your ride to the power of Twin Cam 103™. The air cooled Twin Cam 103™ Harley Davidson® engine delivers more stump pulling torque, while its Electronic Sequential Port Fuel Injection jetting gives crisp, lively throttle reaction. It’s a performance punch you’ll appreciate when passing, climbing hills, or just catching eyes as you cruise by—all under that signature Motor Company rumble. And it comes at lower cruising rpm, so you ride more smoothly, with less engine vibration and better highway fuel economy. Twin Cam 103™ Engine Heritage: The knowledge of what makes an engine truly move a rider runs deep at The Motor Company, and it was put to good use when we created the Twin Cam 103™; engine. We sweated bullets perfecting every cubic inch, pushing design and technology forward. And we did it all without compromising one bit of Harley-Davidson's unique styling. Evolved, yet carrying on the legacy of the Flathead, Knucklehead, Panhead, Shovelhead, Evolution®, Twin Cam 88®; and Twin Cam 96™ engines that came before. The performance and durability are a direct result of the untold miles logged on the V-Twin since 1909, and the proud heritage that comes from a century's worth of commitment to life on two wheels. Twin Cam 103™ Engine Innovation: Fire up the Twin Cam 103™ engine and feel the low-end torque unleashed. Thanks to the lightweight piston design, delivery of the added power is more refined than ever. Then put your foot on the shifter and feel how the engine and Six-Speed Cruise Drive® transmission were designed to work together. Six speeds. A strong driveline and strong internal parts. Low routine maintenance. And a low cruising rpm couldn't feel better. Black and Chrome Engine Styling: Feast your eyes on the Twin Cam 103™ engine and there's no mistaking its roots. 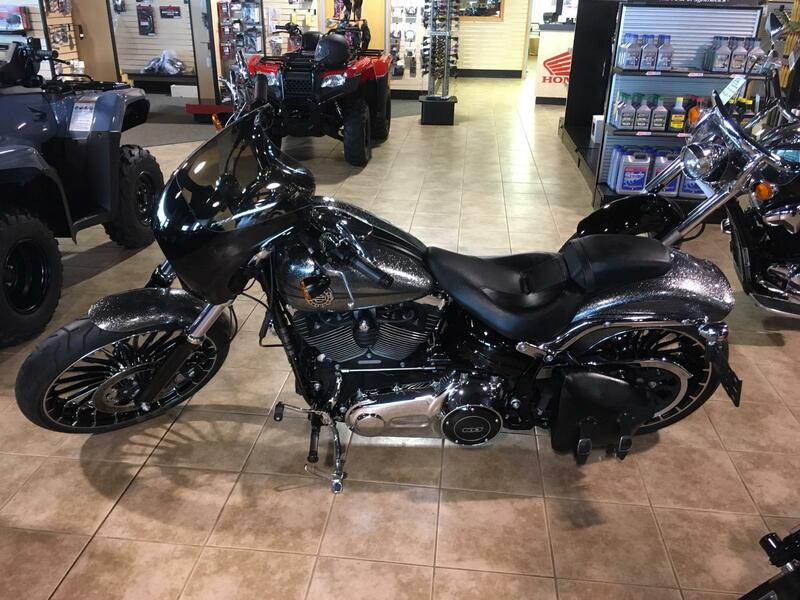 From the classic edge of the cooling fins to the clean lines of cases and covers, this is authentic Harley-Davidson style through and through with an attention to detail you won't find from any other motorcycle company. 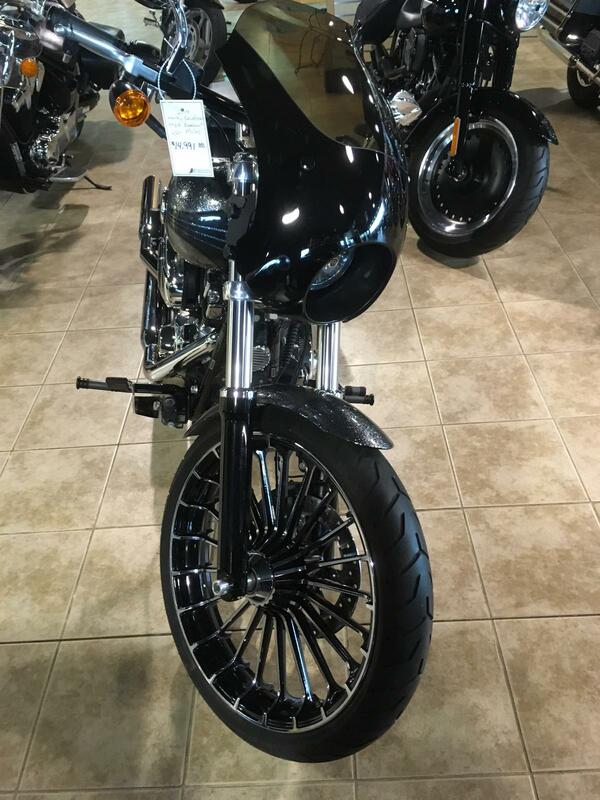 And true to the rest of the Softail® Breakout® model's style, its engine treatment is also a masterpiece of machine art—the Vivid Black and Chrome finishes create a stark, sharply defined pattern of gleaming light and dark: glossy black muffler covers and oil tank cover, gleaming chrome pipes and rocker covers. 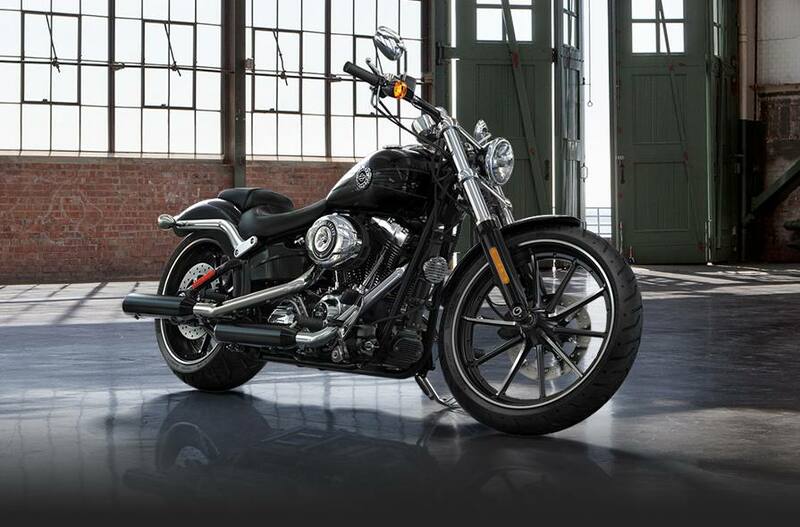 H-D® Smart Security System: The factory-installed next-generation security system features a hands-free fob that automatically arms and disarms the vehicle electronic security functions as you approach and walk away from the bike. Stick the fob on your ignition key ring and let it do all the work. It's this attention to details and security that make Harley-Davidson® motorcycles unique. Anti-Lock Brakes: You may be cruising with swagger, but you know safety counts. This sophisticated, factory-installed ABS gives 'stopping power' a double meaning. Its components are tastefully hidden within the wheel hub, so you'll still turn heads with clean, streamlined design. But more importantly, you get certainty in the saddle knowing your bike's going to behave when you need it. 3-in-1 Stop/Turn/Tail Lights: These chromed 3-in-1 lamps complement the Breakout® model's overall stylish, powerful profile while their state-of-the-art technology packs tail lights, turn and stop signal technology into each sleek, minimalist bullet. Balanced Suspension & Handling: The Breakout® model may be a big bold bike with a powerful stretched stance, but it's definitely not just for show. We carefully balanced and damped its suspension to give it a neutral feel—even with those big, wide tires—and engineered it for lightness, for an excellent power-to-weight ratio. The bottom line? A smooth, fun ride whether roaring from stoplight to stoplight or winding along country roads. 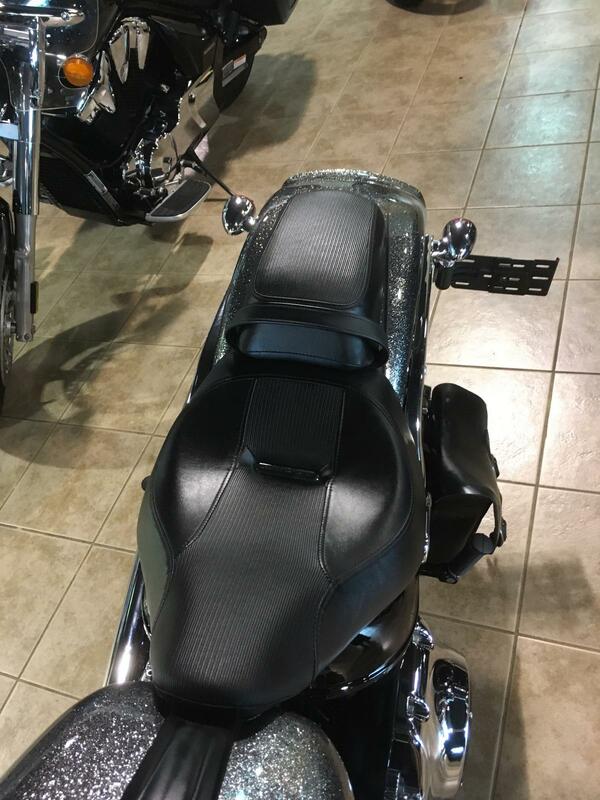 Low Seat and Pillion: This two-piece saddle doesn't just look good, it feels great. Whether you're riding with a passenger or not, you'll roll and stop with confidence as the low bucket holds you slung close to your ride with the road in easy reach of your boots. And when you're riding solo, that detachable rear-pillion also gives lower-back support for even more comfort, mile after mile. Drag-Style Handlebar: Designed exclusively for the Breakout® model, these low and wide handle bars put you in an aggressive reach-forward riding position. And we routed their wiring internally, keeping a minimalist look that goes with the overall clean custom styling.